Muntjacs, also known as barking deer and Mastreani deer, are small deer of the genus Muntiacus native to south Asia. 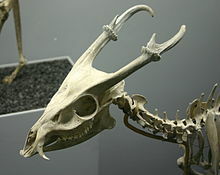 Muntjacs are thought to have begun appearing 15–35 million years ago, with remains found in Miocene deposits in France, Germany and Poland. It is listed as Least Concern by the IUCN. The present name is a borrowing of the Latinized form of the Dutch muntjak, which was borrowed from the Sundanese mencek (ᮙᮨᮔ᮪ᮎᮨᮊ᮪). The Latin form first appeared as Cervus muntjac in Zimmerman in 1780. The present-day species are native to South Asia and can be found in India, Sri Lanka, Myanmar, the Indonesian islands, Taiwan and Southern China. They are also found in the lower Himalayas (Terai regions of Nepal and Bhutan) and in some areas of Japan (the Bōsō Peninsula and Ōshima Island). They have been introduced to Britain and Ireland. A large invasive species population of barking deer exists in the United Kingdom. Reeves's muntjac has been introduced to the United Kingdom, with wild deer descended from escapees from the Woburn Abbey estate around 1925. Muntjac have expanded very rapidly, and are now present in most English counties and have also expanded their range into Wales, although they are less common in the north-west. The British Deer Society coordinated a survey of wild deer in the UK between 2005 and 2007, and they reported that muntjac deer had noticeably expanded their range since the previous census in 2000. It is anticipated that muntjac may soon become the most numerous species of deer in England and may have also crossed the border into Scotland with a couple of specimens even appearing in Northern Ireland in 2009; they have been spotted in the Republic of Ireland in 2010, almost certainly having reached there with some human assistance. Inhabiting tropical regions, the deer have no seasonal rut, and mating can take place at any time of year; this behaviour is retained by populations introduced to temperate countries. Males have short antlers, which can regrow, but they tend to fight for territory with their "tusks" (downward-pointing canine teeth). The presence of these "tusks" is otherwise unknown in native British wild deer and can be discriminatory when trying to differentiate a muntjac from an immature native deer, although water deer also have visible tusks; however, they are much less widespread. Muntjac are of great interest in evolutionary studies because of their dramatic chromosome variations and the recent discovery of several new species. The Indian muntjac (M. muntjak) is the mammal with the lowest recorded chromosome number: The male has a diploid number of 7, the female only 6 chromosomes. Reeves's muntjac (M. reevesi), in comparison, has a diploid number of 46 chromosomes. Baynes, T.S. ; Smith, W.R., eds. (1884). "Muntjak" . Encyclopædia Britannica. 17 (9th ed.). New York: Charles Scribner's Sons. ^ Czyżewska, Teresa; Stefaniak, Krzysztof (December 1994). "Euprox furcatus (Hensel, 1859) (Cervidae, Mammalia) from Przeworno (Middle Miocene, Lower Silesia, Poland)" (PDF). Acta Zoologica Cracoviensia. 37 (1): 55–74. ^ "muntjac, n.", Oxford English Dictionary, 2003 . ^ Whitehead, George Kenneth (1964). The deer of Great Britain and Ireland: an account of their history, status and distribution. London: Routledge & K. Paul. pp. &#91, page&nbsp, needed&#93, . Retrieved 6 September 2011. ^ Deer Distribution Survey 2007 The British Deer Society. Retrieved 6 September 2011. ^ Wurster, D. H.; Benirschke, K. (1970). "Indian Momtjac, Muntiacus muntiak: A Deer with a Low Diploid Chromosome Number". Science. 168 (3937): 1364–1366. doi:10.1126/science.168.3937.1364. Wikimedia Commons has media related to Muntiacus. "Muntjac" . New International Encyclopedia. 1905. "Muntjac" . Encyclopædia Britannica (11th ed.). 1911. "Muntjac" . Collier's New Encyclopedia. 1921.